How would you describe this show in one sentence? 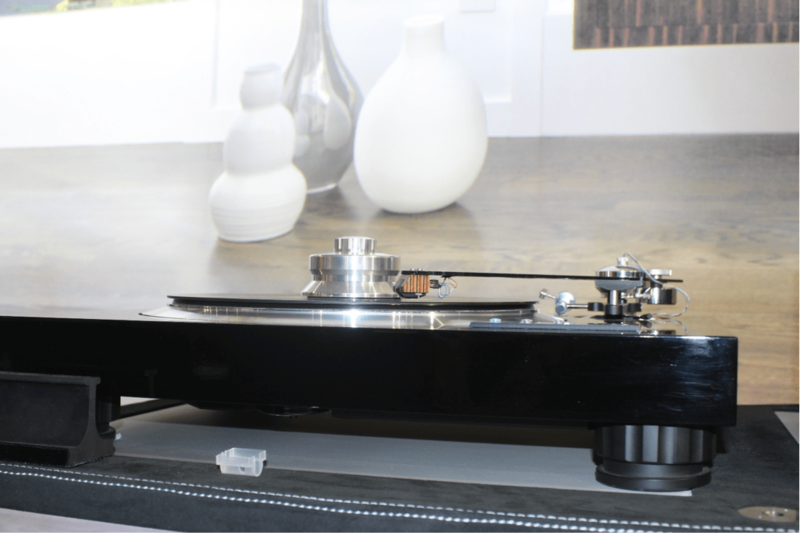 Turntables, more turntables and then even more turntables, connected by cloth covered cables to highly expensive speakers via virtually every amplifier technology known to man. 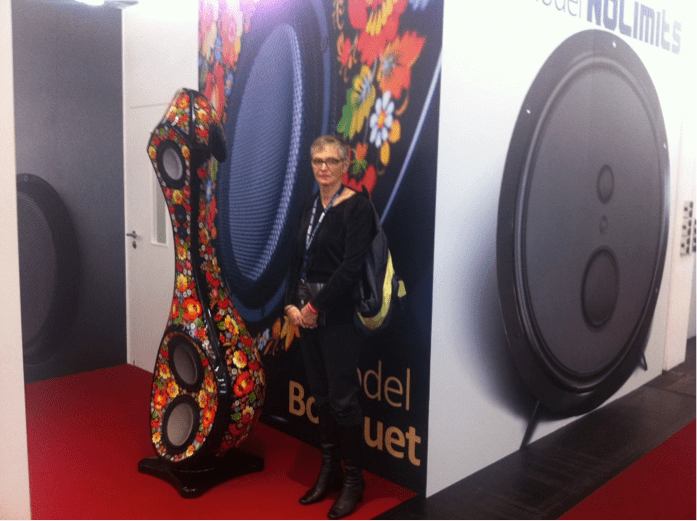 So what did we see, apart from flowery speakers such as this? 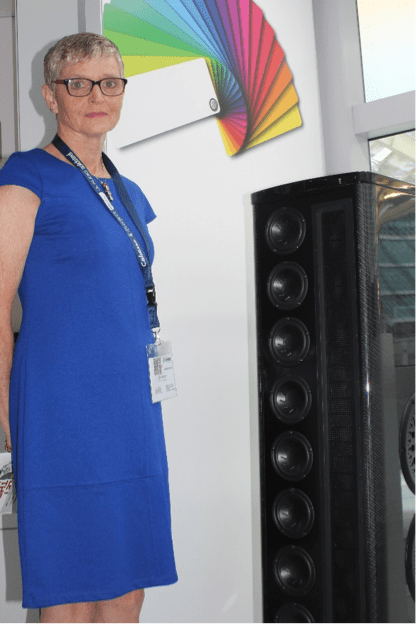 We saw a lot of very expensive speakers (many of them well over NZ$300,000) that did not sound that great. 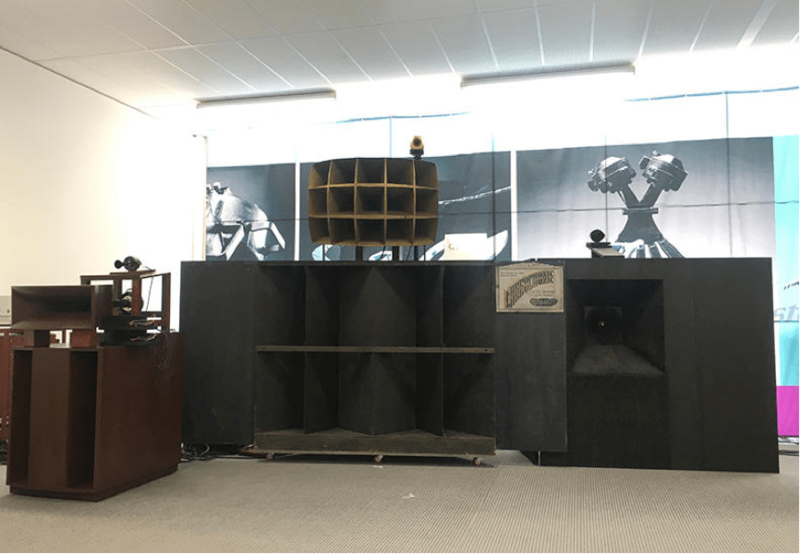 We saw a lot of extremely large horn speakers, including some very rare 1934 speakers from Western Electric – good luck in trying to get these past the décor police in your family! A turntable that was getting lots of interest was the Mag Lev – a magnetically levitating turntable. Funded by a Kickstarter campaign to the tune of NZ$700K, this deck which was slated for release at the end of the year and to sell for around $NZ2100 was generating a lot of interest, but was not able to be listened to, so we will have wait for future news on the sound quality and speed consistency of this rather novel drive method. 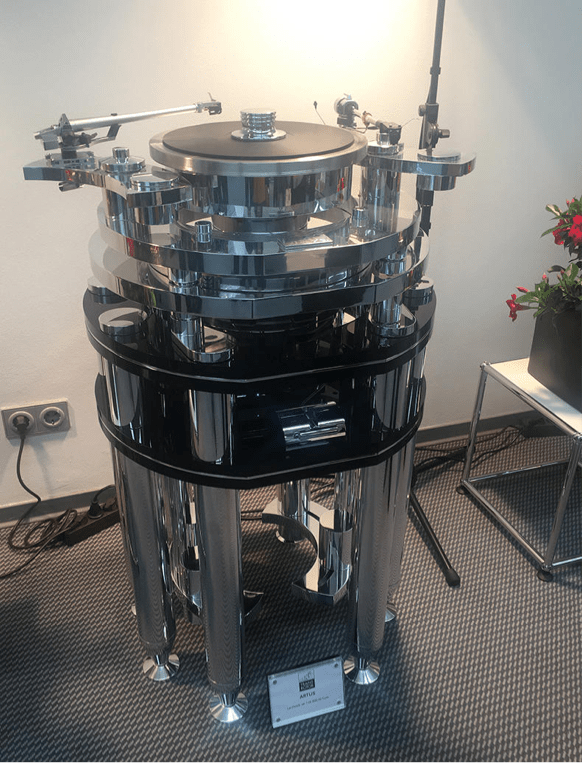 There were reel to reel decks in a few rooms, and more turntables, most of which seemed to be all about how much chrome you could show off, and how much you could flog them for – like this 4ft-tall Artus model from Transrotor, which would set you back more than $NZ184,000! These units up-sample all inputs to DSD, and there are two matching power amps of 80 and 240 watts per channel respectively. They use an analogue preamp and volume control, a class A headphone amp, and have a full range of digital inputs and sources, including internet radio, Bluetooth and streaming services from Tidal and Qobuz. The model 25 comes with built-in CD drive. Best of all these very compact, well-designed units also sounded incredibly sweet, musical and emotionally involving. 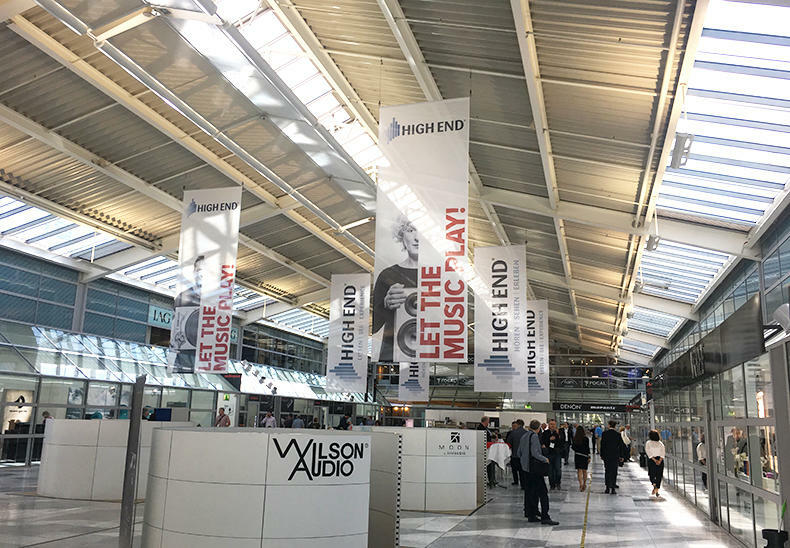 This is an unusual experience at hi-fi shows where the rooms are often less than optimal and there is a lot of background noise. Put a Musicbook 25 with a pair of active speakers and you have a very competent yet compact system. Staying with German hi-fi gear, we moved along to the T+A rooms. 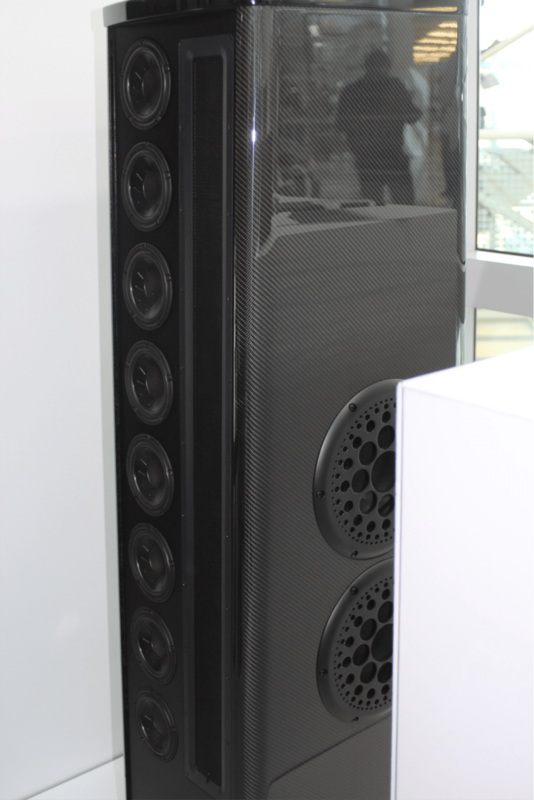 They had three rooms with one set up with a pair of their massive Solitaire speakers in a lovely carbon fibre finish. These speakers are rather unusual in that they use a line source electrostatic tweeter with 8 x 150mm midrange units, again in a line array, and then 4 x side-firing 220mm woofers. 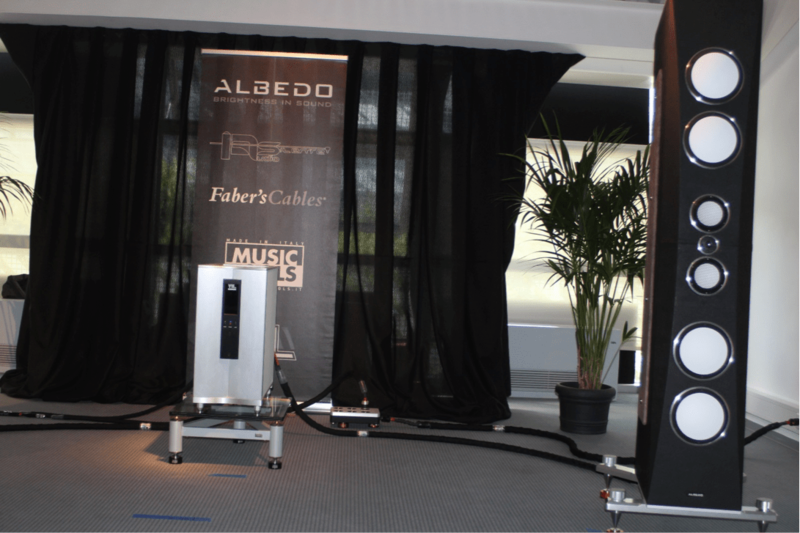 These speakers were producing a very accurate sound with great emotional involvement. I had taken a very nice recording of a closely miked female vocalist with me. Many of the systems completely obscured just how emotional this recording can be, but on a good system, no matter what the price range, you should feel the hairs on the back of your neck stand up… this system did exactly that for me! They are not cheap speakers at NZ $70,000 a pair, but they certainly sounded better than many competitors that were several times their price when playing this disc. They were being driven by a PA3100HV integrated amplifier fed by PS3000HV power supply with the source being a PDP3000HV SACD/CD player/DSD DAC. I had wanted to see the new Jeff Rowland Daemon integrated amplifier, because it was getting a lot of positive comments and also because it is one of the most expensive integrated amps in existence. 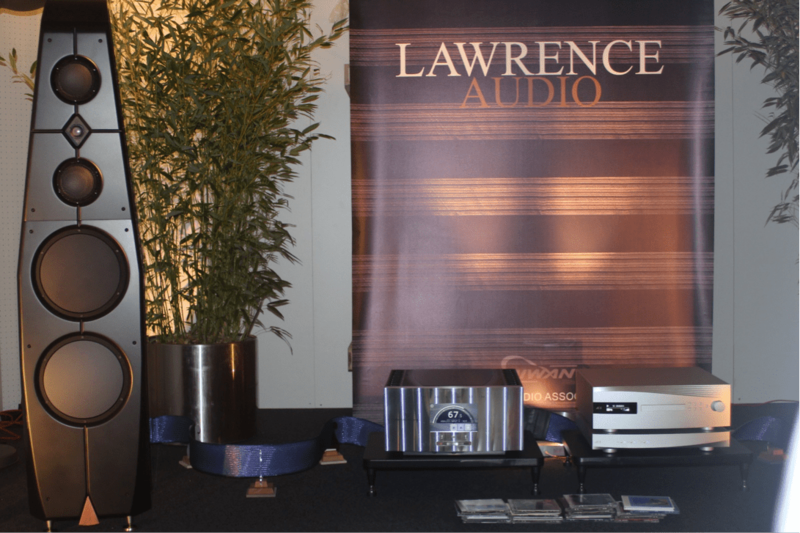 I tracked one down to the Lawrence Audio room where it was driving a very large pair of Lawrence Audio speakers. This amp is just beautiful looking and has some very cool features. One is that if you are only using a few of the many inputs, which you can rename to anything that you like, you can set the menu to only display the inputs that you are using. Unused inputs are not shown. This makes a lot of sense. The display was also very large which made it easy to read from across the room. The sound was impeccable as I have come to expect from JRDG designs. Jeff Rowland Daemon on the left and Soulution source at the right. VTL had a couple of rooms running their amps. This one was running the S400 stereo power amp. It sounded very effortless and open. 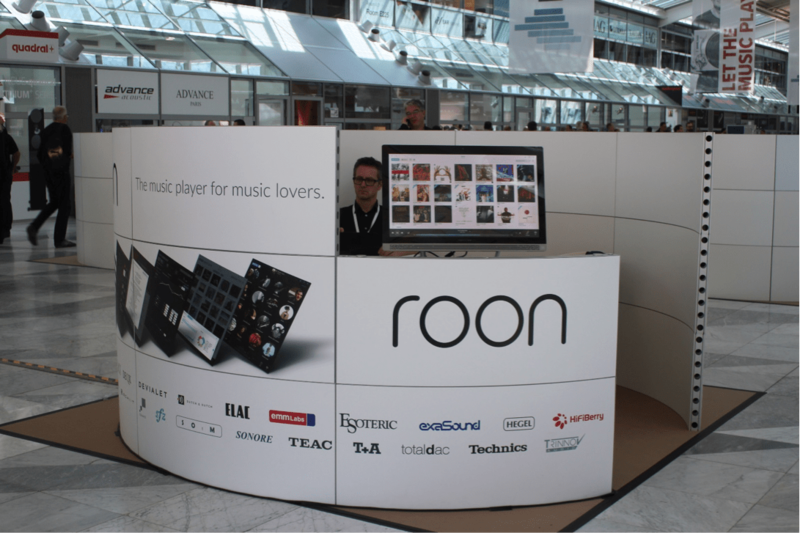 A trend that I noted was that many brands were embracing the Roon system for music playing software, as shown here. Another trend was towards the Google Casting method of serving music from mobile platforms as opposed to Bluetooth. Many makers are moving this way it seems. There was much interest in MQA and Tidal too. 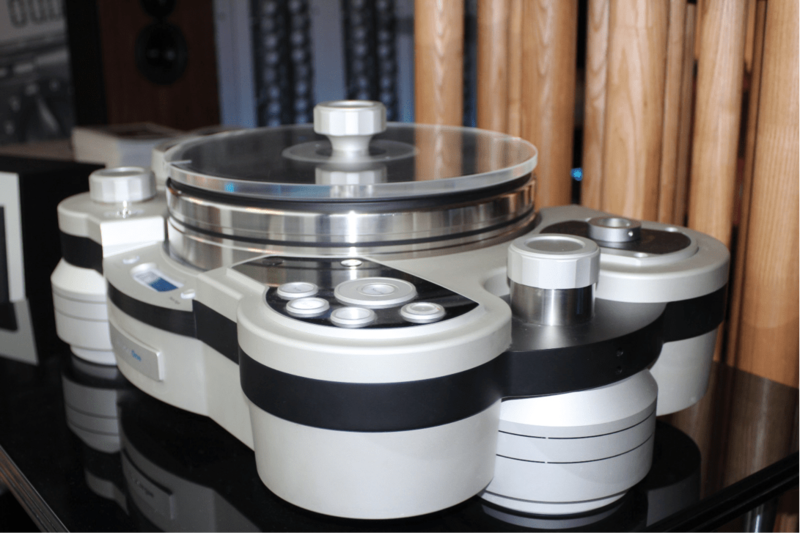 TechDas Air Force One turntable – another $150K turntable on display. Could you get a thinner tonearm than this? 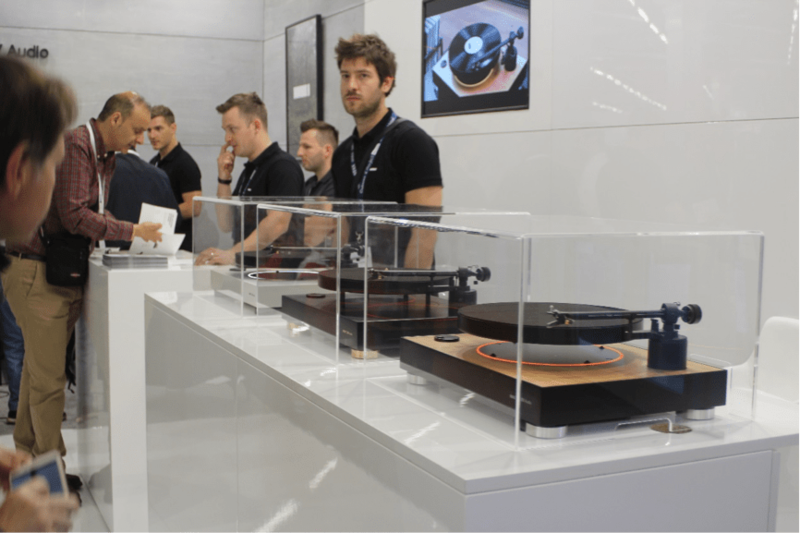 I could write for days on the huge number of interesting products on display, from the most entry level brands like Music Hall right up to esoterica at prices that few will ever be able to afford. I have only scratched the surface, but I have mentioned products that stood out for me, and that made music come alive and engaged me on much more than a technical level. * Paul Quilter is head honcho at PQ Imports.